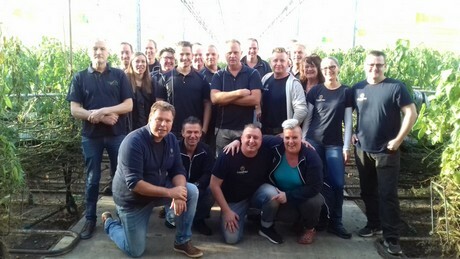 This week CombiVliet picked the last cherry tomatoes at location MaasVliet in Maasdijk. Theo van Vliet (general director CombiVliet): "We have grown this type of tomato for years and will now say goodbye to our cherry tomatoes. This is for us a moment to stand still. Our manager Peter van Dijk has, in the 21 years he has been working for us, never had anything else than cherry tomatoes." The team CombiVliet working with the cherry tomatoes at MaasVliet or in the past on another location. "In 1990 we started growing the first cherry tomatoes in ‘s-Gravenzande. Before we had beefsteak tomatoes. In 1984, when we started with beefsteak tomatoes, it was a real innovation at the time. Before only single, round tomatoes were grown. When more and more growers switched to beefsteak tomatoes, the price came to be under pressure. In this period we encountered small, round tomatoes. 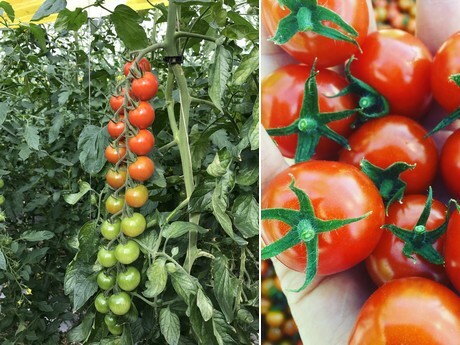 The cherry tomato was a new specialized growth, which was very labor intensive in harvesting and packaging. Everything was packed in special small boxes, which was new in the market, and to us. A challenge! The cherry tomatoes were known as "tasty tomatoes". The market at that time consisted of round tomatoes, beefsteak tomatoes, and cherry tomatoes. 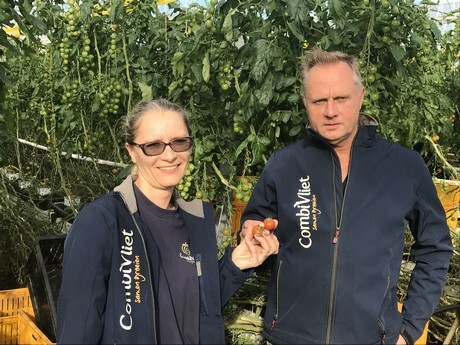 Nobody had heard of tomatoes-on-the-vine..."
"We are 28 years later, and as CombiVliet we have 28 growing years in cherry tomato experience. In the heyday, we grew cherry tomatoes at 18 ha, which was a lot in that time. We named our company after them, Van Vliet Cherry Tomatoes, and we were known as such. "Oh, you are the cherry tomato guys?" is something we have been asked a lot. "Since a few years, cherry tomatoes gradually made way for the so-called snack tomatoes and many other sorts which you see now. The profit of the cherry tomatoes was under pressure because of this. The prices decreased. Logically, because no new specific cherry tomato varieties were developed, and at one point, you reach the end. Consumers do want some variety and honestly, many comparably tasty, and tastier tomatoes have been introduced in the past years. A few years ago, we started with 1 garden of santas, and that has been gradually expanded to all unlighted companies as of December." 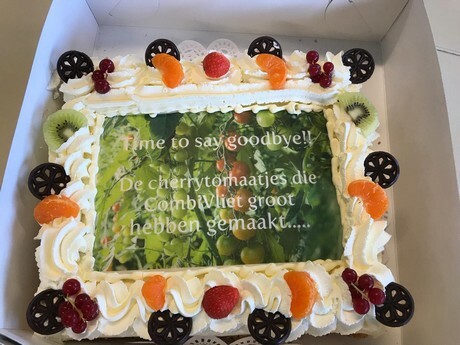 During a farewell meeting at location MaasVliet, the last cherry tomatoes were commemorated with everybody who worked with the cherry tomatoes in the history of CombiVliet. A nice cake was a beautiful conclusion of the age of the cherry tomato. CombiVliet has, besides santas in the lighted greenhouses, also coarse tomatoes-on-the-vine, medium coarse tomatoes-on-the-vine, and cocktail tomatoes, which are also harvested on the vine.